It was only the second time in 264 Grand Slam matches that Spaniard Nadal has retired - the last being against Briton Andy Murray in the quarter-finals of the 2010 Australian Open. "Now is not the moment to say what's going on or what's not going on because we really don't know yet," said Nadal. "Somebody who is running the tour should think little bit about what's going on," he said. "Too many people are getting injured. "I don't know if they have to think a little bit about the health of the players. Not for now that we are playing, but there is life after tennis. "I don't know if we keep playing in this very, very hard surfaces what's going to happen in the future with our lives." The third set was much more evenly contested and went Nadal's way in a tie-break. 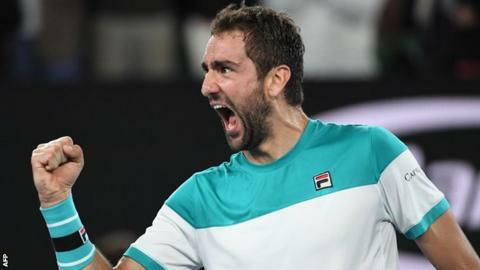 Cilic was dominant on his first serve - firing down 20 aces to his opponent's three - but Nadal was able to draw the 29-year-old Croat to the net on numerous occasions - the most memorable ending in a delicate drop shot which left Cilic foundering. Nadal's injury became apparent in the fourth set and despite lengthy delays for treatment, he was unable to continue - retiring at 2-0 in the deciding set. "It was an unbelievable performance from both of us and it's really unfortunate for Rafa," said Cilic. "He always gives his best and it's unfortunate for him to end this way. "I was really paying attention to these first couple of games [in the final set] and trying to keep my intensity up. It was important for me to continue with my own game and not look across the net." Nadal has had more than his fair share of disappointment at the Australian Open. The 2009 champion lost to Novak Djokovic after nearly six hours on court in the 2012 final, was restricted by injury in his final with Stan Wawrinka two years later and then last year was denied a second title by Roger Federer's epic final-set performance. Nadal hardly ever retires before the final point is won. So to watch him limping down the tunnel was a miserable conclusion to a gripping match. A six-week break between tennis seasons is just not sufficient for those elite eight players who qualify for the ATP Finals in London. Nadal's other constant plea is to play more events on clay. Of course that would suit him, but the toll on the joints is less demanding. Would Nadal have gone on to win this match? Quite possibly not. Cilic had that glint in his eye from the first ball. And when he serves with this authority and hits the ball with this aggression, he can be very difficult to stop - as he proved with his run to the US Open title in 2014.